The wife of President Goodluck Jonathan, Patience, was not a contestant for any political office in the just concluded general election. However, she was more prominent at the various campaigns of her political party, the Peoples Democratic Party, was involved in – during the countdown to the polls. She was optimistic that her intervention in the campaigns would save from defeat her husband, who was the presidential candidate of the PDP – and whose public rating had plummeted. Popularly referred to as ‘Mama Peace’ by admirers, Patience was a delight to watch as she danced to various songs by popular musicians on magnificently decorated podiums draped in the party ’s green-white-red flag colours. And she had no patience when lambasting the opposition All Progressives Congress, which was at the receiving end of her outbursts. Indeed, Patience poked direct verbal attacks and innuendos at the presidential candidate of the APC, Muhammadu Buhari. At a campaign rally organised in collaboration with PDP women in Lokoja, Kogi State, Patience appealed to her audience to vote en masse for the PDP and her husband. She said that Buhari’s brain is dead. Urged to speak further by her supporters who shouted, “Mama Peace, tell them,” she described Buhari as unfit to govern Nigeria. At the Akwa Ibom PDP women rally, Patience took time to teach the women the meaning of “corruption.” Her decision to speak on the topic, it was gathered, was informed by the APC’s anti-corruption campaign. In the countdown to the presidential election, especially, the Jonathan administration was accused on many occasions of being weak to wage war on corruption. But Patience said the APC’s promise to fight corruption should be discarded, describing it as a lie. She urged the electorate in the state not to throw away the opportunity of returning her husband to power, saying that a bird in hand is worth two in the bush. Besides, she warned that the opposition was planning to build prisons where she said criminals would to be kept. Buttressing her illustration with one of her hands behind her, she said, “A bird at hand is worth a million in the bush. Nigerian women, let us shine our eyes. Women of Nigeria, are you ready to go to prison? Are you ready to go and give your father food in the prison? It is not our portion. We reject it. “Akwa Ibom State is a PDP state. It’s not for expired drugs, because APC cannot heal you, outdated drugs cannot heal you. Let them call it any name. Just like as my husband younger brother (Governor Godswill Akpabio) have (sic) said, they will continue changing name until they will reach (sic) Ebola. And they will call it Ebola. Her many references to prison in the course of her campaigns suggested that Patience dreaded jail. At Ibadan, Patience stated that the APC was planning to send her to prison. But in order to avoid this, she invoked the ‘Holy ghost fire’. As she prepares to vacate Aso Rock with her husband on May 29, Nigerians will still recall how she burst into tears when she realised that Hajiya Nana Shettima, the wife of Borno State Governor, was absent at a second enlarged stakeholders’ meeting on the abducted schoolgirls. The President’s wife burst into tears after she took a roll call and discovered that the governor’s wife and the other people she invited refused to honour her invitation. Before she shed tears, she said repeatedly, “There is God in everything we are doing. There is God in everything we are doing. Those bloods that are sharing in Borno will answer. God will answer. What of two teachers that can tell us that they conducted that exam, do you come with any, Principal? No, too? Na only you waka come? Chai, chai, there’s God, there is God , there is God!’’ And Patience wept. PDP women leaders such as Amina, the wife of Vice-President Namadi Sambo; Helen, the wife of the Senate President, David Mark; and PDP national women leader, Kema Chikwe, among several others, will miss the enthusiasm and fun Patience brings to politicking. Even her fellow African ‘First Ladies’ are getting set to bid her goodbye as she prepares to quit her position as the President of the African Ladies Peace Mission. 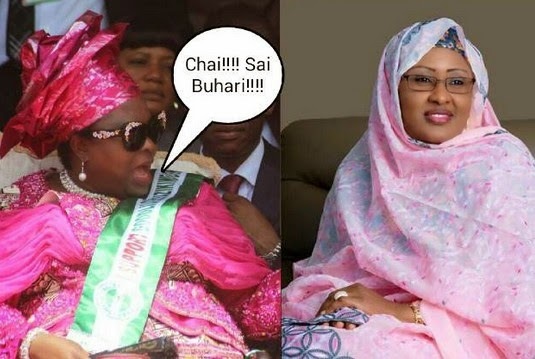 Nigerians are patiently waiting to see if her successor, Aishat Buhari, would surpass the records set by the Rivers-born politician. In this piece, PUNCH's Olusola Fabiyi recounts the style brought to the political space by the wife of President Goodluck Jonathan, Patience, during the outgoing political dispensation.